Mark your calendar’s for KLWA’s Annual Membership Meeting on Saturday, July 14, 12pm - 2pm at the Mahopac Public Library. Each year the President reports on the “State of the Watershed”, summarizes events and accomplishments for the year and offers proposals for the year ahead. The annual meeting is also a great opportunity to meet your neighbors, enjoy a cool drink and tasty snacks, and learn more about your role in watershed protection. The lake drawdown will begin around the 14th of November. Please prepare your lake front areas for the winter. Now is good time to plant and enhance the filtering capability of your shoreline. Every bit helps to keep our lake cleaner. The 2017 annual membership meeting was held at 12:00 pm on July 8, 2017 at the Mahopac Public Library, 3rd floor. Thank you to all of those that attended. Photos from the July 9, 2016 KLWA Membership meeting at Mahopac Public Library. About 30 KLWA members, new and old, turned out for this year's Membership Meeting, Saturday, July 9 at the Mahopac Public Library. Several people have already stepped forward to take up some of the regular work involved in maintaining financial and membership records, as well as coordinating regular water chestnut hand pulls throughout the season. Among those who volunteered were Cathy Izzo, who offered to keep KLWA's membership records and make bank deposits of contributions. Robin Belsky offered to organize the water chestnut pulls, an ongoing management project that occurs 3-4 times each season. And prior to the meeting, Regina Calciano volunteered to pick up KLWA's post office box mail every week. KLWA President Joe Montuori pointed out that others already volunteer in such activities as the Watershed Stewards and Carp Screen Maintenance Committees. "Without all of these volunteers," Joe said, "I would have no time to organize new projects that will achieve our goals. More volunteers means more progress." Options for watershed management were also discussed and several actions were approved, while others were tabled for further consideration by the Watershed Stewards and Board of Directors. Homeowner education remains an important pillar of KLWA's management plan. Given that every homeowner has a septic system and yard, the association will continue to educate regarding "good housekeeping" principles through the website, Facebook page, eNewsletters, brochures, and pamphlets. This year, Board member and Watershed Steward Jane Kartsch produced a KLWA homeowners' brochure with important information about septics, lawn care, landscaping and more. The more homeowners who adhere to these guidelines, the cleaner the lake will become over time. The Stewards also plan to work with the Town of Carmel to maintain and improve storm water drains, especially those closest to the lake. Among those actions to be implemented are a storm drain marker project to educate and remind residents that storm drains empty into local streams and lakes —many directly into Kirk Lake. Which storm drain marker should KLWA install on local storm drains? Another management action to be taken includes a "No wake — 5 MPH" buoy at the north end of the lake, educational Invasive Plant warning signs and a small invasive plant drop off point on the County Conservation land. Another proposal under consideration is a "Healthy Yard Pledge." Homeowners could pledge to have their septic system pumped and inspected every 1, 2, or 3 years, refrain from using phosphorus fertilizers or pesticides on their lawns, and more. For more information, view the slide presentation below from the meeting. Why You Shouldn't "Leave the lights on." LIGHT POLLUTION occurs when outdoor lighting is misdirected, misplaced, unshielded, excessive or unnecessary. As a result, light spills unnecessarily upward and outward, causing glare, light trespass, and a nighttime urban “sky glow” overhead, indicating wasted energy and obscuring the stars overhead. Direct your outdoor lights toward the ground and turn them off when not in use. Install shielded fixtures or light bulbs that direct the light only where you need it, adjusting the wattage necessary for the task. Stand on your property lines and check for light trespassing onto your neighbors’ property. When away, put indoor lamps on timers for security purposes or use an alarm. Outdoor lighting alone will not provide protection from theft, graffiti, or vandalism. Find out about your local and state outdoor lighting codes. Ask your neighbors to do the same. Write, call or email your state and local elected officials, urging them to strengthen and enforce outdoor lighting codes and to require businesses, schools, institutions, municipalities, and individuals to comply. Ask your neighbors to do the same. Energy conservation through sensible lighting practices means less dollars spent on expensive electricity, and less pollution in generating that energy, primarily by burning fossil fuels. The night is full of birds, animals, and fish whose habitats are negatively affected by artificial light. There is evidence that light at night is a health risk for humans, both for sleep deprivation and reduction in tumor suppressing melatonin. Our stars are a natural resource. For generations before us and after us, with your help, the night sky can remain a source of inspiration, information, and contemplation. Thanks to KLWA Board member, Pamela Stanley, for bringing this article and issue to our attention. See also this article from the New York Times. "The most important nugget for me is that bright lights stop Daphne from coming to the surface to eat algae," Stanley said, "and thus a lighted lake promotes algal blooms." "Birds and other wildlife are also adversely affected by light pollution," she added. "We should all do what we can to get lakesiders to shield and train outside lights directly downwards, and to turn them off when they are not needed." KLWA held its Annual Membership Meeting on Saturday, July 11 at the Mahopac Public Library Community Room (3rd floor). Click here for more photos. A presentation on the recently completed Watershed Management Plan explained potential solutions and next steps that will be taken toward improving Kirk Lake water and watershed quality. Attendees asked and got answers to many excellent questions. The Blue Heron Award was presented to Robin Belsky, a long-time volunteer who clearly exemplifies the spirit and ethic of lake stewardship. Check back soon for photos. President Joe Montuori discussed the Board's plans for moving KLWA's management from plan to action. Two new committees will be formed -- the Lake Stewards Committee and the Watershed Stewards Committee -- to focus on in-lake and out-of-lake work respectively. Joe stressed that volunteers are critical to moving KLWA's work forward. "The financial support from our members has been essential and sufficient up until now. To have completed both the carp project and our own management plan in less than six years is unheard of amongst new lake and watershed associations. Your generosity and support made that happen." "We're now starting a new stage of KLWA's work. Money alone is inadequate. We need concerned people to educate and work with our associations, neighbors, and local government to further improve the watershed's health and vitality," Joe added. The annual NYS Federation of Lake Associations (NYSFOLA) conference was again held in Hamilton, NY on May 1-3, 2015. Joe Montuori represented KLWA, attending workshops on several issues facing area lakes including blue-green algae blooms and invasive plants. Other workshops presented various volunteer monitoring programs; boat inspection programs; and others evaluated the latest technologies and practices to halt the spread and combat invasive plants and animals. Several workshops emphasized the use of volunteers to patrol and monitor, and even maintain a lake's health. One such workshop, presented by a Schroon Lake association member, described an "Invasives Scout" program. Volunteers take responsibility to monitor the same length of shoreline each week, reporting the results to a volunteer coordinator. Kirk Lake could take this idea and repurpose it for its needs, such as monitoring storm drains, algal blooms, and the like. Montuori presented a workshop on KLWA's volunteer effort to hand pull invasive water chestnut plants that infest the northern wetlands area, and are encroaching on the lake's main body in recent years. KLWA will continue this hand pulling program with the first pull scheduled for June. A Common Loon graced Kirk Lake's waters over the weekend of April 11th. Keep your eyes peeled for it's large dark green head, red eye (it wasn't caused by a flash!) and beautiful black and white feather markings.This aquatic bird dives for its food. It was most likely migrating north to the Adirondacks or other points north where loons nest and breed in summer. Click here for more photos. The Watershed Management Plan, a year and one half in the making, is finally complete. KLWA's contractor, Jim Sutherland, submitted the report to the Board in March. The report looked at data regarding the lake as well as the watershed itself, and proposes specific solutions to improve the lake's water quality in the short term, and management of the watershed in the long term. The Board will meet to discuss the report at a Board meeting on Saturday, April 18. Allied conducted many of the preliminary studies of Kirk Lake including plant and fish life, a bathymetry mapping, and numerous water quality tests. A PDF copy can be found on the Documents page. A hard copy is also available at the Mahopac Public Library. A fitting Winter Solstice tribute to our lake's improving health. Click here for more photos. Huzzah! KLWA closes out a banner year! KLWA has accomplished more in 2014 than any year since our founding in 2009. And the lake has never looked better. Aquatic plant growth was minimal and algae blooms didn’t occur until the end of the season. That’s something to be proud of! Look closely and you'll see that Kirk Lake was touched by a rainbow! Throughout 2014, our organization has conducted a full-fledged management study that will detail the watershed’s problems and offer solutions that will help to improve and rejuvenate the lake and surrounding watershed. A great big “Thank you!” to all of you who made this work possible. First and foremost, the members who have so generously contributed, the volunteers who have given of their time and energy, and our board members who steered us through this process. Jim Sutherland, KLWA consultant, conducting water testing to round out KLWA's data for its watershed management plan. Reworking of the KLWA website. Regular email blasts keeping the membership informed. Pulling of hundreds of pounds of invasive water chestnut plants from the lake and the wetlands area north of Stocum Road. Determination of the watershed’s major inlets. Testing of Kirk Lake’s major water sources. Creation of a Bathymetry Map, detailing the entire lake bed’s surface and depth within inches. 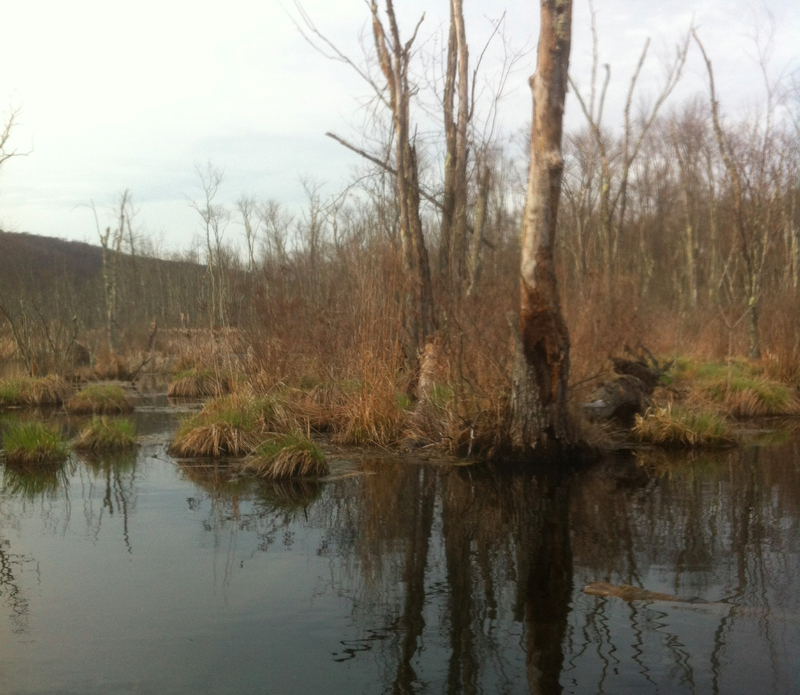 These wetlands help to purify the source waters of Kirk Lake, north of Stocum Road. And we raised enough money to pay for all of this. But we have lots of expenses coming up. Membership presentation and Q & A session with the study’s developers. Implementation of the management plan. Won’t you help us continue in the year ahead with an end of year, tax-deductible contribution to Kirk Lake Watershed Association? Click here to donate online or send a check payable to Kirk Lake Watershed Association Inc., P.O. Box 191, Mahopac Falls, NY 10542. See links to more photos and reports below. Ron Allstadt received the Great Blue Heron Award for volunteer service from KLWA President Joe Montuori during the Members' Meeting on July 12. Also awarded was Lynn Ligay, founding Board member and former Secretary. See more pictures here, or find us on Facebook. This year's Membership Meeting was well-attended and lively, with about 30 residents attending from all points around the lake. Allied Biological's Senior Biologist, Chris Doyle, and consultant Jim Sutherland, made presentations to the Board and members regarding their compilation and analysis of Kirk Lake water quality data, and answered some excellent questions from the audience. Their full report, that will indicate recommended actions to improve and protect water quality and the watershed's environment, is expected in January 2015. A special membership meeting will be held to present the plan. Treasurer Alan Raines discussed the 2014 Budget, highlighting the need for continued fundraising in anticipation of management projects ahead. Other highlights of this year's meeting included reports regarding progress made in 2013, Board Elections, and presentation of the beautiful new Kirk Lake Bathymetry map. The map was created by Allied Biological as part of the management planning process. The current Board was also reelected to another three year term, as discussed by Board Vice President, Minia Sas, who chaired the Nominations Committee. Board President, Joe Montuori, discussed the geographic scope of the watershed and the importance of focusing beyond the lake itself to maintain the environment and water quality throughout this area. In fact, the lake makes up only about 14% of the watershed. Kirk Lake itself is about 124 acres, while the watershed measures 863 acres. Think about all the rain that hits that large area and eventually flows into Kirk Lake! Consultant Jim Sutherland discusses Kirk Lake water quality factors. To view Jim's presentation, as well as that of Allied Biological Senior Biologist Chris Doyle, click here. A key consideration the Board will discuss at its August meeting is whether to proceed with a fishery survey. This would provide a baseline of information about what fish species, in what amounts, are currently present in the lake. The survey's cost is a consideration, however. If conducted, the fishery survey would complement the aquatic vegetation survey that's already being conducted this month. Both of these surveys would arm KLWA with data to make wise choices regarding future management actions. The meeting closed with presentation of the Great Blue Heron Award to two KLWA volunteers. Ron Allstadt was presented the award (see photo above) for his consistent and physically strenuous work maintaining and cleaning the "Grass Carp Anti-Emigration Device" -- more commonly known as "the carp screen." Working with the Screen Maintenance Committee, headed by Board Member Alan Belsky, Ron ensures that the screen is cleaned after major storms and during regular inspections. A special award was also made to Lynn Ligay, founding Board member and former Secretary of KLWA. Lynn recently relocated to -- another lake, where else? -- in the State of Maine. Best wishes to Lynn on her new lake! Thanks to all of of the Board and volunteers who make KLWA the successful organization it has become. Good bye and many thanks to Lynn Ligay, secretary of KLWA, and founding board member. Good luck and best wishes on your move to Maine. And at the same time we welcome Alan Belsky as our newest board member. From its inception, KLWA has sought a comprehensive approach to managing the watershed, including Kirk Lake itself. Why concern ourselves with more than the lake? Because the watershed-the land area that contributes water to the lake-largely determines the quality of the lake water. In order to improve and maintain Kirk Lake, we need to improve and maintain the watershed. Now that KLWA has released grass carp to keep the invasive aquatic plants at bay, we will develop a comprehensive, long term plan to address the roots of Kirk Lake's overall health. The two biggest concerns of watershed residents, according to KLWA's 2009 resident survey, were excessive aquatic plants and algae. Developing a watershed management plan will require a close look at the sources of excess nutrients in the watershed and in the lake itself. Sources include septic systems on and off the lake, storm water runoff and even nutrients in the lake bed's sediment that contribute to excessive algae and plant growth. Learning how much each pollution source contributes is essential to prioritizing management efforts. For example, focusing on septic systems might be a poor use of resources if the lake bed is the largest source of excess nutrients. Once each source has been assessed, KLWA will determine the best methods to deal with the problem. Naturally all of this requires a great deal of time, effort, and money. 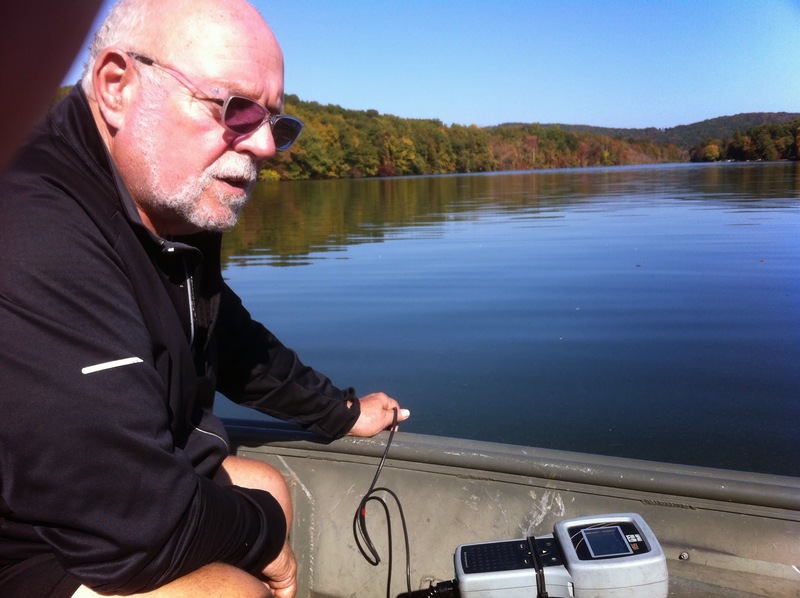 Each step of the way KLWA will seek guidance from NYSFOLA, the state wide federation of lake associations, as well as professional limnologists, or lake scientists. 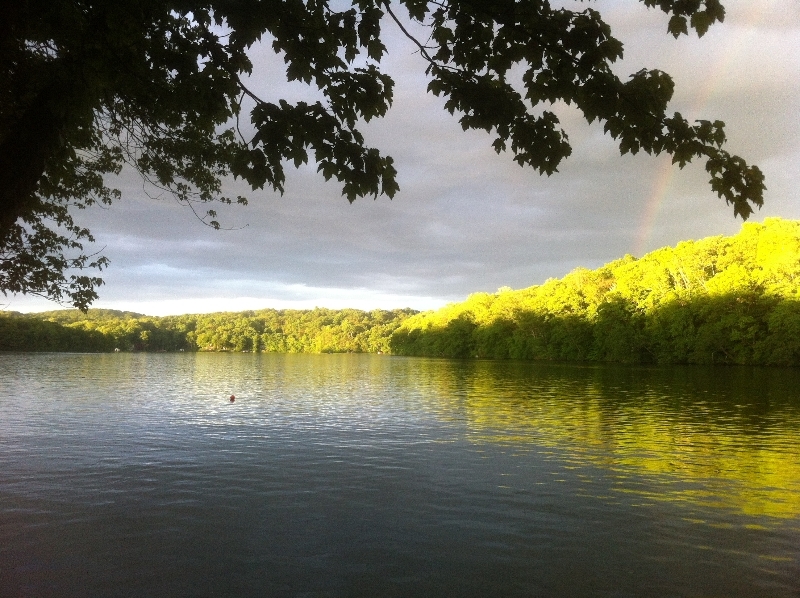 One recent step KLWA has taken is the acquisition of 10 years of Kirk Lake water quality data from New York City's Department of Environmental Protection. That will save KLWA years of time and effort. KLWA can always use volunteers! From a single hour to an ongoing project, the Association always has work that needs doing. Currently, we have several committees that need help, and often have an errand or chore that needs a one-time effort. Some work can be done in the comfort of your home, and some requires serious physical effort. We need students, parents and seniors. Students can earn high school Community Service hours while helping out the environment and our community. Committees include Membership, Newsletter, Website, Watershed Management, Lake Cleanup and Carp Screen Management. In addition, KLWA needs volunteers at the Membership meeting, for lake cleanups and to patrol the lake to identify and report issues of concern. KLWA's progress is only as fast as our volunteers' participation. After all, KLWA is purely volunteer with no paid employees whatsoever!